In our own southwestern Ontario backyard, researchers at the University of Western Ontario are helping to build the case that autism is a biological disorder impacting the digestive tract, immune system and the brain. With his team, Dr. Derrick MacFabe, M.D., Director of the Kilee Patchell-Evans Group, is investigating the possible role of gut metabolites in autism. This award winning research has been listed among the top 50 scientific discoveries in Canada by the National Sciences and Engineering Council of Canada (NSERC). Using a novel rodent model, Dr. MacFabe’s team is identifying the possible role of the bacterium species Clostridia in autism. Clostridia species are most well known for causing diarrhea from infections with C. diff or Clostridum Difficile. Of particular interest to Dr. MacFabe was the Clostridial species because of its early colonization of the digestive tract, its ability to resist antibiotic treatment and ability to cause opportunistic infection in hospital and community settings. It is well known that the risk of autism is associated with pre and post natal infection. Dr. MacFabe and his team postulated that the overuse of antibiotics that has contributed to an increase in Clostridia infections could also be playing a role in the path physiology of autism. So far the information discovered by the research group has shocked and awed the autism world. Propionic acid (PPA), derived the Clostridia bacteria, when injected into rodents, resulted in dramatic changes in behaviour. The PPA rodents, as they are referred to, have shown astonishing changes and have started displaying repetitive behaviours, spinning, seizures activity, convulsions, pushing away, hyperactivity, altered social interaction and impairment in “play” like behaviour. Upon examination, the brains of PPA rodents showed many of the same metabolic, biochemical and physiological abnormalities identified by other investigators including inflammation in the brain as found by Martha Herbert. M.D, Ph.D, pediatric neurologist and assistant professor at Harvard University, and Carlos Pardo, M.D., assistant professor of neurology and pathology in the division of Neuroimmunology and Neuroinfectious Disorders at Johns Hopkins University School of Medicine. Dr. Pardo, senior author of a report on brain inflammation published in the Annals of Neurology, commented that his “findings reinforce the theory that immune response in the brain is involved in autism, although it is not yet clear whether the inflammation is a consequence of disease or a cause of it, or both”. One of the most exciting aspects of Dr. MacFabe’s findings is that he is bringing together key research from other investigators. Among the most significant findings are irregularities in immune function, brain inflammation and detoxification impairment. Missing from all this incredible research being done across the globe is something that ties all of biological issues together into a working model of ASD. While each piece of the puzzle is important, to date, no single avenue of research has been able to explain the complex interplay between genetics, environment, biochemistry and physiology. That may be changing. A Dr. MacFabe investigation into the role of clostridia and gut metabolites is changing the path of autism by bringing together ground breaking research from around the world. 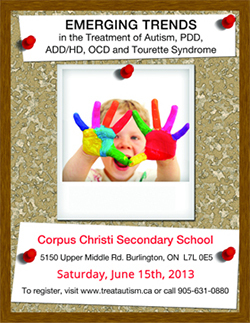 He describes it, while addressing attendees at Canada’s inaugural Autism One Conference in 2009, as “a start, an important way to bring research together”. There is a complex ecosystem in the digestive tract that is often referred to as the microbiome. The National Institutes of Health, who also spearheaded the human genome project, is now setting on a course to sequence the genetics of the microbes that live in the digestive tract. This Human Microbiome Project has identified that the human gut plays a crucial role in post natal development. Dr. MacFabe’s research comes at a time when the view of autism is changing. Many leading investigators including Martha Herbert feel that autism is a “whole body disorder” impacting the gut, immune system and brain. The digestive tract is the heart of the innate immune system. The intestines and the immune system both play a key role in regulating inflammation. Studies have shown that 46%-85% of children with ASD have gastrointestinal problems including constipation, diarrhea, cramping and pain. Dr. S. Jill James, Ph.D, is the Director of the Metabolic Genomics Laboratory at Arkansas Children’s Hospital Research Institute (ACHRI). She has discovered some very important factors in the causation of autism. One such finding surrounds an enzyme needed to detoxify metals and pesticides, called glutathione. Dr. James found that glutathione is 80% depleted in children with ASD. Dr. MacFabe’s PPA rodent showed this same depletion in glutathione suggesting a mechanism of increased susceptibility of the autistic brain to environmental toxicity. Other key findings by Dr. James include methylation, a biochemical cycle crucial for development and gene expression, as well as issues and oxidative stress. These findings have also been mirrored by the Clostridia research. The links keep falling into place the more research is done on the PPA rodents. The UWO research highlights the ability of PPA to increase oxidative stress, shut off glutathione in the brain and induce multiple genes by impacting the methylation cycle. Some of these genes are implicated in learning, neurodevelopment, learning, aggression and anxiety. Much more research is need to put all of the pieces of autism together but this research is already changing the way that autism is viewed by the medical community. Physicians using the biological model of autism to treat children are having tremendous success in promoting and enhancing development. These types of treatments, termed biomedical, mean there is new hope for autism treatment!